Preface The aim of the book is to present the basic elements of electromagnetic theory for an introductory course. This text presumes an understanding of basic calculus. The subject is developed in terms of vectors and analysis of vectors but without great detail concerning mathematical aspects of vector analysis. The text treats the subject in the order starting with vector analysis, static (constant) electric field, then steady magnetic field, and then progresses to the changing magnetic and electric fields. The text then describes the formation of Maxwell's equations. The last seven chapters are written for a somewhat more advanced field-theory course at graduate level. 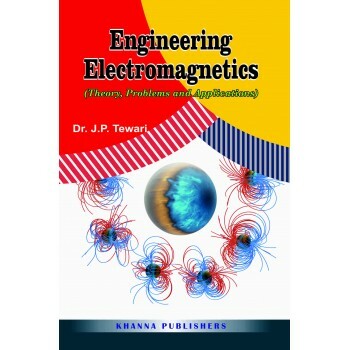 These chapters treat plane waves in dielectric and conducting media, guided waves transmission lines, wave-guides, resonant cavities and radiation from antennas in free space.The book contains large number of solved examples to illustrate the concept discussed in the theory part of the subject matter. At the end of each chapter, unsolved problems are included to assist the reader to acquire strong base for the chapter to follow." Table of Contents * Vector Analysis * Coulomb's Law and Electric Field Intensity * Static Electric Field Solutions to Static Field Problems Numerical Methods * Field Mapping Technique for static Electric Field Problems * Steady Electric Current * Static Magnetic Field of Steady Electric Current * Static Magnetic Field of Ferromagnetic Materials * Electromagnetic Induction * Maxwell's Equations * Plane Electromagnetic Waves * Guided Electromagnetic Waves * TEM Waves on two Conductor Transmission Lines * Wave Guides * Resonant Cavities * Antenna and Radiation.